Debugging tool for convenient sniffing of proxy channel raw data. Recently we have introduced the proxy protocol into the flespi platform to allow forking of the incoming raw telemetry data stream to several destinations. Another application of the proxy channel is debugging connectivity issues. Since proxy transmits raw data, investigating data packets implies extensive exposure to endless HEX sequences. Being heavily involved in packet sniffing, we were highly interested in a tool that would facilitate the process as much as possible. So, meet the HEX Viewer as a part of the flespi Toolbox — colorful, flexible, and practical. To start working with the HEX viewer login with https://toolbox.flespi.io/ (or find the Toolbox link in the left-side menu of the flespi panel), unfold the Telematics hub item and select HEX Viewer. 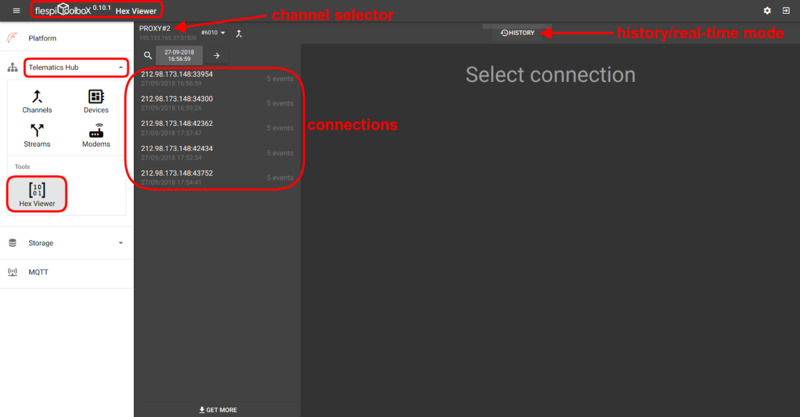 Then you drill down the sequence — channel -> connection -> event. Note that HEX Viewer works only with proxy channels carrying raw data. Select the one you want to look into from the drop-down on top. Then you can switch between the history and real-time modes depending on the task. If in history mode, you have a date/time picker to quickly move to the desired moment. With the channel picked, you see a list of connections for the chosen time (or the current moment). Click on the connection to view the details. HEX Viewer only makes sense for the purple events that contain the actual payload. The only information that you can see for connect/disconnect events is the time they occurred. Note: select several events with the Ctrl key pressed to see the payload of several packets on the same screen. A magnifying glass above the connections and events list allows searching in the given list. For connections, you can search by IP and port. For events, you can search by connection type (incoming or target). There’s often the need to copy the data you are investigating into another application, in an email, etc. Yes, it is still a hex viewer with the sole purpose of making the perception of the hexadecimal values friendlier. We simply tried to make it more ergonomic. Give it a try and let us know about your experience.